The way of life and the history of Native American Indians include the differences in languages between the main Indian tribes in each of the main groups and regions. Learn about the languages of the indigenous people of North America. 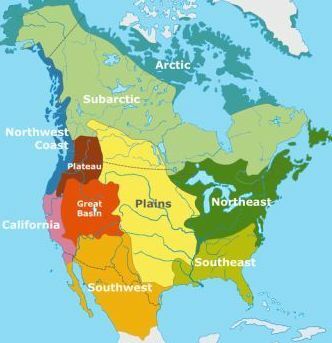 The culture groups of Native American are categorised according to the divisions illustrated on the map and details of the main languages spoken by the people of these areas are detailed below. The groups are categorised as Northwest Native Americans, the Northeast Woodlands Indians, the Southwest Indians, the Southeast Native Americans, the Arctic and Sub-Arctic Indians and the Native Americans of California. The Arctic Native American culture area included Alaska, Canada and Greenland and the tribes of Aleut and Inuit people who both spoke the Eskimo Aleut language. The Sub-Arctic Native American culture area covered inland Alaska and Canada and the languages were divided into two groups. The tribes of Kuchin and Beaver people who spoke the Athabaskan language and the eastern tribes of the Cree, Objiway (Chippewa) and the Naskapi who spoke the Algonquian language. The Northeast Native American culture area covered the Atlantic coast from Canada to North Carolina and the languages were divided into two groups. The tribes of the Erie, Onondaga, Seneca, Tuscarora, Cayuga and Oneida people who spoke the Iroquoian language and the tribes of the Menominee, Pequot, Delaware, Fox, Shawnee and Wampanoag who spoke the Algonquian language. The Northwest Native American culture area covered dense forest and mountains and the tribes of Haida, Chinook, Eyak, Coast Salish, Tlingit, Tillamook and Chimakum people who spoke Chinookan, Athapaskan and Penutian languages. Penutian encompassed a large division of languages spoken in the Pacific northwest, near the Columbia River basin, including Chinookan, Oregon Penutian, Tsimshianic and Utian. The Southeast Native American culture area covered north of the Gulf of Mexico and the 'five civilised tribes' of the Cherokee, Chickasaw, Choctaw, Creek and Seminole people who spoke the Muskogean language. The Southwest Native American culture area covered the massive desert region and the tribes of the Hopi, Zuni, Yuam, Apache and Navajo people who spoke a Southern Athabaskan (Apachean) language. The Californian Native American culture area was home to tribes such as the Hokan, Maidu, Miwok, Pomo, Chumash and Serrano people whose languages included the Athapaskan, Penutian and Uto-Aztecan dialects. The Plateau Native American culture area included fast flowing rivers and the tribes of Klamath, Modoc, Nez Perce, Walla Walla and Yakama people who spoke a variety of languages including Siouan, Algonquian, Caddoan, Uto-Aztecan and Athabaskan. 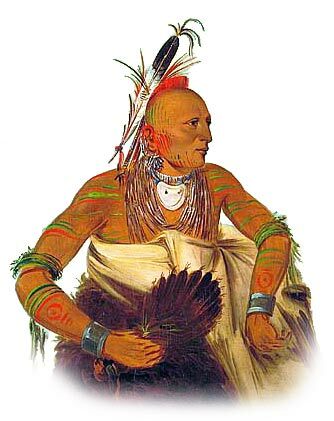 The Great Plains Native American culture area covered the prairies of central North America which was home to many tribes including the Crow, Cheyenne, Blackfoot and Comanche. The people of this vast area spoke a variety of languages including Siouan, Algonquian, Caddoan, Uto-Aztecan and Athabaskan. The variety of languages were due to introduction of the horse by the Europeans which made the hunting lifestyle very attractive to many nomadic tribes. Siouan languages were a family of North American languages. The main language groups included tribes such as the Winnebago, Iowa, Oto, Missouri, Ponca, Omaha, Kansa, Osage, Quapaw, Sioux or Dakota, Hidatsa, Crow and Mandan. Other, now-extinct languages, included Tufelo and Biloxi. The Siouan languages include those spoken by the Iroquois, Creeks, Pomos and the Sioux in regions ranging from the northeast, the southeast, the Plains and northern California. Although Aleut derives from the same parent language as the Eskimo (Inuit) languages, the two language groups (Aleut and Eskimo Inuit) have evolved in distinct ways. The main dialect groupings are Eastern Aleut, Atkan, and Attuan (now extinct). These dialects show influence from the Russian language. The first to record Aleut was a Frenchman called Alphonse Pinart, in 1871, shortly after the United States purchase of Alaska. The Aleut languages were spoke by Native American people of the Artic and Sub-Artic regions. The word "Eskimo" is an Algonquian word meaning 'those who eat their meat raw.' The word "Inuit" means "We people." The Inuit ate approximately half their meat raw. Algonquian has a subfamily of around 30 languages is divided into three groups according to geography: Plains, Central, and Eastern Algonquian. The majority of Native American Algonquian languages are extremely endangered today and many are already extinct. The Algonquian languages, spoken by many tribes of the Eastern Woodlands and the Plains and tribes inhabiting the Far West. The word 'Athabaskan' is a version of the Cree name for Lake Athabasca in Canada. The name was assigned by Albert Gallatin in his 1836 classification of the languages of North America. The Athabaskan language family is divided into three groups based on geographic distribution consisting of Northern Athabaskan, Pacific Coast Athabaskan, and Southern Athabaskan or Apachean. The Native American Athabascan languages were spoken by the Navajos, and by some west coast Indians. The Athabascan language was spoken by nomadic hunters who travelled long distances to hunt herds of caribou and moose and fish the rivers for salmon. The small family of Chinookan languages of the far Western tribes which included Oregon and Washington along the Columbia River by Chinook peoples. The "Chinook Jargon," or language, began in the 1700's during the period of history when explorers came to region. The Native American Chinookan language is a mixture of many tribes across the Northwest, as well as English and French. Uto-Aztecan language is a family of American Indian languages. The Uto-Aztecan homeland is generally thought to have been somewhere in the Southwestern United States - Arizona, New Mexico or northern Mexico. The Shoshonian language is a subfamily of Uto-Aztecan. The Uto-Aztecan (Numic) languages are spoken in the Great Basin, the Rocky Mountains, the Plains, and the south including the Pueblos and the Aztecs of Mexico. Native American Languages. Discover the vast selection of pictures and videos of Native Indians. The pictures show the clothing, weapons and decorations that can be used as a really useful educational resource for kids and children of all ages. Our series of videos enable fast access to the images, pics, paintings and pictures together with information and many facts. We hope that this article on Native American Languages will assist in your studies or homework and that you will enjoy watching the videos featuring many pictures of the Indians. A great educational resource for kids on the subject of Native American Languages.